De opere tercie diei. [The creation of the world - Second and third day] Foliu III - SCHEDEL, H.
Title : De opere tercie diei. [The creation of the world - Second and third day] Foliu III. Description :An interesting element in the progression of series is that the plates for the second and third day have been printed in the wrong order, as in all issues of the Chronicle. The third day in the creation of the world is presented with imaginative sense of design and symbolism in a series of circular diagrams with the hand of God in the upper left corner. 5 rings of space represent the additional creation of earth, water, fire and ice. 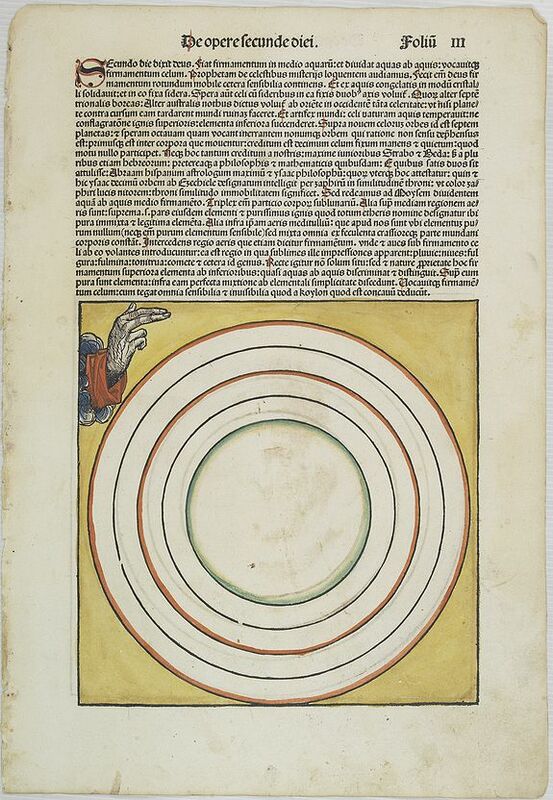 On verso the creation of the firmament after the division of light from darkness is depicted with 4 rings of space. Page from the richest illustrated Incunabula, the famous: Liber chronicarum or Nuremberg Chronicle, published the year that Columbus returned to Europe after discovering America. Condition : Marginal spotting. Some age toning and smudging of paper. Generally very good condition.